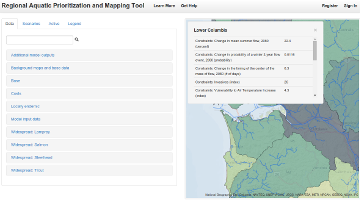 The Regional Aquatic Prioritization and Mapping Tool is an aquatic priorities decision support system for Oregon, Washington, and Idaho developed by Ecotrust and the U.S. Fish and Wildlife Service (USFWS). Starting in July of 2010, Ecotrust partnered with the USFWS Pacific Region Fisheries Program to develop this regional aquatic priorities decision-support tool for Oregon, Washington, and Idaho. The decision support system was developed to prioritize sub-basins to focus conservation and restoration of freshwater habitats to ensure the long-term sustainability of the region's aquatic and fisheries resources while considering how factors such as watershed condition, climate change and aquatic invasive species affect regional priorities. Using this tool, Ecotrust and USFWS evaluated a wide variety of watershed priorities at the 4th field sub-basin scale. In developing this tool, Ecotrust and USFWS collaborated with partners already involved with strategic, regional-scale aquatic habitat restoration, including USDA Forest Service, NOAA Fisheries, U.S. Geological Survey, and Trout Unlimited, among others. Rather than duplicating work that has already been conducted, this work has built on existing efforts and supplements gaps in previous work while incorporating aspects of climate change impacts and the spread of aquatic invasive species. The result is an automated analytical tool that is used to evaluate a wide array of watershed priorities given different species of concern and optional priority constraints such as watershed condition, climate change, and aquatic invasive species. While you must be a registered user to create priority scenarios, a public facing version of the tool was created to allow interested individuals, organizations, or agencies to map and explore the priorities identified by Ecotrust and USFWS, as well as visualize the many datasets that support the analysis. The tool itself is an open source, online mapping application that allows users to zoom in, pan and query a wide variety of mapped data.